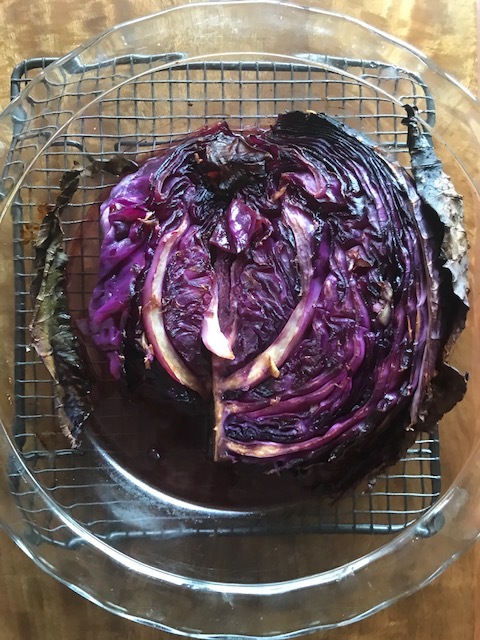 Until recently my red cabbage repertoire was limited to two recipes – one a conventional raw cabbage slaw and the other Jamie Oliver’s braised Christmas red cabbage. But after reading more about the health benefits of all things purple I wanted to find another way to use red (also called purple) cabbage. Hence my welcomed discovery of roasted red cabbage steaks. Although I’m calling these juicy chunks of purple goodness “steaks” don’t take this too literally. Of course you can chop the cabbage into steak like slices – or like me go for wedge like shapes, each one held together with a piece of the core. Either way the resulting tender chunks of cabbage are delicious. So delicious in fact that I tucked in before taking a couple of photos – so what you see here is one whole wedge and one partial one…. After making these steaks (or wedges) for the first time this week I’m hooked and with this post I’m hoping to tempt you to try a new way to show off the humble, yet nutrition packed, vegetable that is cabbage. And if purple foods just aren’t your thing then you could always try this recipe using a green cabbage instead. Purple vegetables are all the rage right now and this recipe is about as easy and cost effective as preparing them gets – I hope you like it! Remove any loose outer leaves from the cabbage and cut it into 8 wedge shaped pieces (or 4 wedges if you’re using half a cabbage). An easy way to do this is to first slice the cabbage into quarters and then slice each quarter into two. The core that remains on each wedge should hold the leaves in place. Massage the exposed surface of each wedge with coconut oil and then season well with salt and pepper. You could also add some spices (cumin powder or fennel seeds would work well). Transfer the wedges into an oven proof dish and cover tightly with foil. This prevents the outer leaves burning during the first phase of cooking. Bake in the oven at around 200C for 30 minutes and then remove the foil and drizzle the cabbage with balsamic vinegar. Bake for another 20-30 minutes or until the cabbage is tender. Serve your cabbage steaks as the hero of a vegan or vegetarian meal alongside some extras. I served mine with a side of mashed spiced sweet potato and my Indian pineapple pickle. Tags: recipe, red cabbage, roasted, steaks, wedges. Bookmark the permalink. Tasty, healthy and easy to make. Nice combination. Hi Lucy – yes it would be a great dish for Christmas….now why didn’t I think of that! Wow ! It looks so beautiful & tempting !! Laura, what a revelation! I, for one, love all things purple when it comes to food. And I adore red cabbage. I’ve never cooked it like this – never even thought to cook it like this. But a fab idea – will have to try. Thank you Tracey – I’m glad you like the recipe as a fan of all things purple. Let me know how it goes…. This looks so pretty and sounds delish, too! Thanks for sharing, Laura! Thanks Jhuls…..Certainly not a cheat day meal (ha ha) but tasty nevertheless! Thanks Agness for the lovely feedback and yes when it comes to red cabbage Summer is the season for a slaw and Winter for these hearty steaks! Laura, I am a big fan of red cabbage and balsamic vinegar and these roasted steaks sound delicious! 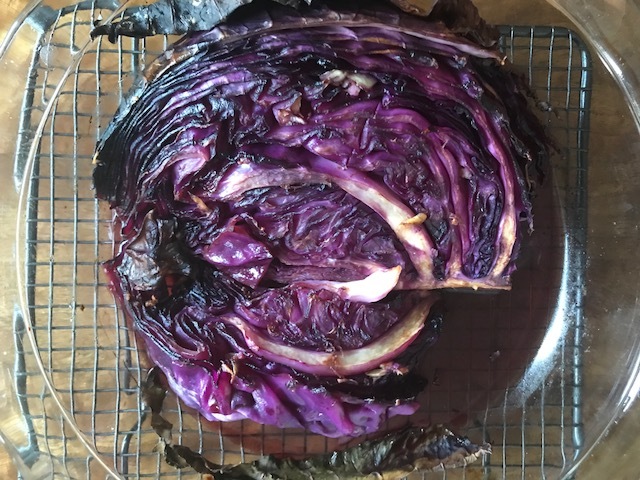 Yes agree Sandhya – balsamic pairs so well with red cabbage and this recipe is so simple too….. Thanks Eartha and yes if you’re a cabbage fan then I’m sure this recipe will be a winner – just be sure to extend the cooking time as needed until the cabbage is really tender…..
Any excuse to turn on the oven is appreciated these days but getting something good to eat in return is more than welcomed. We will have to try this. Thanks Annika and Happy New Year too….. It DOES sound really simple. I love cabbage. I eat it raw and snack on it all the time, and love all kinds of slaws, ,so I know I’d love this, too. Great recipe! Thanks Mollie – glad you like it! Thanks for this. My repertoire is the same – either a slaw or a braised dish. The red cabbages at the market are absolutely beautiful right now. Will be trying this for sure (doing vegetarian January). Thank you and yes it’s a great way to show off red cabbage – so hearty! Yes agree although they’re a very close second place!